Are you excited about the total solar eclipse that will occur next Monday? On August 21, 2017, all of North America will be able to see the eclipse, either a total solar eclipse or a partial one. Families, teachers, and librarians are using this event to ignite interest in science and astronomy. Take some time before the event to talk with kids near you about how the earth rotates around the sun, the moon spins around the earth and what happens during an eclipse. 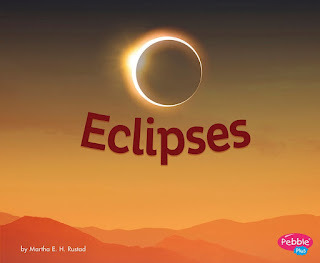 While several website also explain about eclipses, I have found that they are quite wordy and complex. The best resource I've found for younger students is a print book, Eclipses by Martha E.H. Rustad, available in paperback or library binding. The advantage of a print book is that students can return to it on their own, thinking more about what happened during the eclipse. Rustad clearly explains in short, simple sentences what happens during a solar and a lunar eclipse. This would be good to read aloud with young children (ages 4-7), or have for 2nd graders to read independently. "The moon and Earth move in paths called orbits. Earth orbits the sun. The moon orbits Earth. Sometimes these paths line up. Then an eclipse happens." Bold photos and a good diagram help create interest and explain the concepts. A glossary, recommended further reading and an index are included at the end. Combine digital and print resources with physical hands-on models to help students develop an understanding of the solar system and envision what's happening during an eclipse. These two videos are good starting places. This video from SciShowKids is short and geared to younger kids, but you'll need to explain that it was created for the eclipse that happened in Europe in 2015. This next video, from Vox, is longer and more detailed, and so it's better for older children. 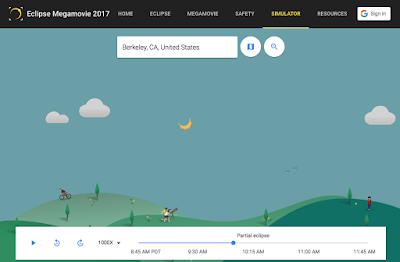 I also really liked the web resources from both NASA (eclipse2017.nasa.gov) and from the Google/UCBerkeley project Eclipse Megamovie 2017. In particular, check out the eclipse simulator where you can enter your location and see the simulation of what the eclipse will look like in your area. “The eclipse will help students appreciate the beauty of space — feel that joy and sense of wonder, ask questions and create their own journey of understanding the universe and their place in it." The review copy was kindly sent by the publisher, Capstone Press. If you make a purchase using the Amazon links on this site, a small portion goes to Great Kid Books. Thank you for your support. Standing strong together -- using books to connect us. I am deeply saddened by the violence that occurred in Charlottesville, Virginia last weekend. It anguishes me that people in our country are filled with hatred, resort to violence to assert their views, and openly carry military weapons. As I struggle with these feelings, I recall the words of Javaka Steptoe as he accepted the 2017 Coretta Scott King Illustrator Award for his masterful picture book Radiant Child. Javaka reflected on how our country and our communities are changing and the opportunities this presents. "Against all odds, we have made something of this place, and if we can respect one another’s truths, if we can see outside of ourselves, we can be our brothers’ and sisters’ keepers. Representing all aspects of our society is not about fulfilling the selfish desires of a small special-interest group. It is about supplying power to the people of America." Stories have the power to connect us, helping us "see outside of ourselves," as Javaka said. Reading about other people helps us respect each other's journeys and experiences. "Resist/Speak up. Teach yr kids same. The mind of an adult begins in the imagination of a child. Peace." And so I focus on books that help us see each other more fully, that foster the imagination, that make kids want to read more. Because this is how I can help actively make the world a better place. Thank you to all of the artists and authors who help me in this journey, who share their stories to help us all connect. Thank you to all of the teachers and librarians, parents and friends who help me discover more books to share. And especially, thank you to all of the students who share their stories, their reading lives with me. You all give so much of yourselves. 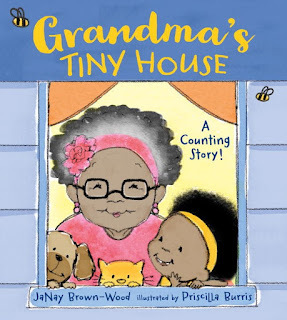 Counting books are a dime a dozen, but Grandma's Tiny House rises above the rest of this crowded field. Teachers and families will appreciate this loving African American family, the story and rhymes that bring this beyond your typical counting book. A grandmother welcomes her family, friends, and neighbors into her home for a wonderful feast, and everyone brings food to share. Cheerful rhymes mark the arrival of different guests. "THREE neighbors knock on the brown wooden door, with FOUR pots of hot greens and ham hocks galore." As more folks arrive, the house quickly fills. Where is everyone going to go? Aunties, cousins, grandkids -- it's quite a houseful. 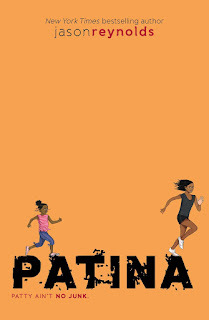 This counting story is firmly set in an African American home with specific details, a joyful community and lots of love. Many families and teachers are looking for diverse stories just like this, where race and ethnicity is a part of the story because it's just part of the family's life -- not a point of conflict. This is a counting book with lots of feeling and smiles to go around. If you're interested in more math books, check out the Mathical Prize for children's books. "The Mathical Book Prize is an annual award for fiction and nonfiction books that inspire children of all ages to see math in the world around them." Thanks to friend and fellow blogger Betsy Bird for bringing this award to my attention! This prize is organized by the Mathematical Sciences Research Institute (MSRI), in partnership with the National Council of Teachers of English (NCTE) and the National Council of Teachers of Mathematics (NCTM). The review copy was kindly sent by the publisher, Charlesbridge Books. If you make a purchase using the Amazon links on this site, a small portion goes to Great Kid Books. Thank you for your support. Have you ever imagined what your pets get up to while you're away? Victoria Jamieson takes this notion and gives it a fresh spin, imagining a trio of classroom pets and their antics when the kids go home for the day. Pets on the Loose! is a terrific series for kids moving into longer stories, whether you're reading it aloud together or kids are gobbling it up on their own. 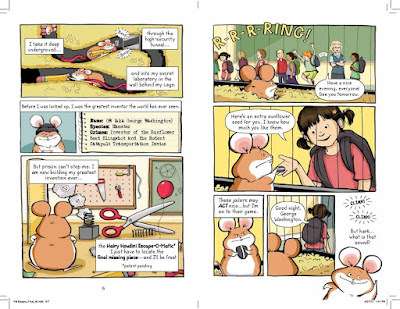 George Washington, or "GW" for short, plays the part of a a sweet, innocent classroom hamster, but the second graders at Daisy P. Flugelhorn Elementary School don't know that he's an experienced con man. Having been locked up in 2nd grade for three months, he's determined to escape and reunite with his pals Barry the rabbit and Biter the guinea pig. "Prison can't stop me. I am now building my greatest invention ever... the Hairy Houdini Escape-O-Matic." 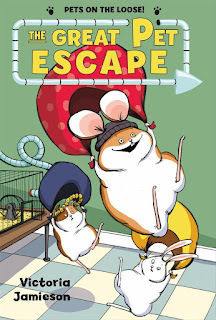 As soon as GW escapes and frees his pals, they run into their biggest problem: Harriet the mouse. With her minion mice and Lucinda, the 5th grade pet snake, Harriet is planning to cause chaos in the school by preparing "the most vile, disgusting lunch they've EVER seen." Kids will crack up at the thought of mice running havoc in the cafeteria, adding chocolate chips and pickles to the casserole, making soup with ketchup, relish and mustard. The food fight finale will certainly bring giggles a plenty, and kids will relish (ha!) how the friends support one another. I love the pacing and goofy humor in this graphic novel. GW is cute but mischievous, a good friend but also pretty self-centered. Readers new to longer graphic novels will appreciate that each panel only has one or two short sentences, and that the whole story is captured in eleven short chapters. 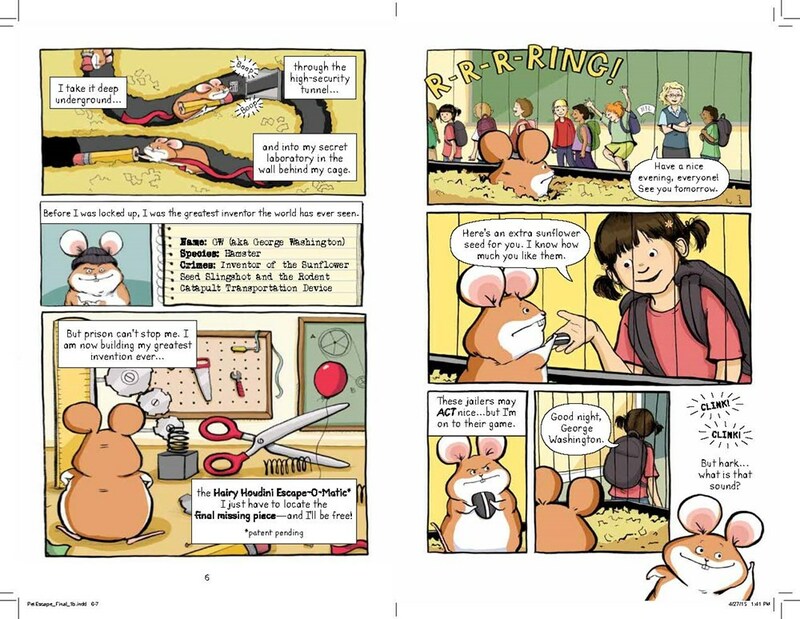 GW the hamster continue his adventures with his friends, this time saving the students’ art show from sabotage by Harriet the mouse. As the story opens, the pets have settled into a nice routine in each of their classrooms. They want to go to the art room to make a card for GW's friend Carina, but it's on the 2nd floor -- the domain of Harriet and her minions. How are they going to make it all the way there? Harriet and her minions are plotting to steal Carina’s picture from the art show, wrecking havoc on the school once again. Worst of all, they going to frame GW and his friends so that they will be sent away to St. Bart’s Obedience School for Unruly Pets. One of my favorite experiences as a mom was reading aloud a graphic novel to my daughter when she was in 3rd grade. We snuggled up together, each reading different characters' parts aloud. 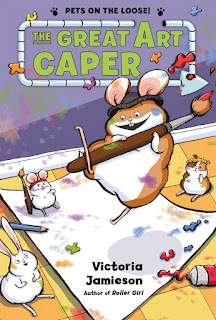 This series would make a great comic book to read aloud with 1st, 2nd or 3rd graders who are ready to listen and read along with a longer story. The review copies came from our public library, checked out through Axis 360 ebooks. If you make a purchase using the Amazon links on this site, a small portion goes to Great Kid Books. Thank you for your support. Are you setting off on an adventure this summer? Try listening to Dominic, by William Steig, and you'll find a story full of adventure, heart and humor--perfect for family listening. 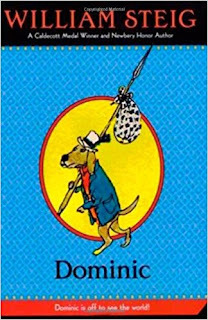 Dominic is a dog in search of his fortune. He leaves his home, taking only his hat and his piccolo, and along the way he meets many animals, developing new friends as he goes. My children were captivated by Dominic's story, as he bumbles his way along, searching for - well, he doesn't quite know what. Dominic learns about the world and himself as he makes new friends and outwits the notorious Doomsday gang. Originally published in 1972, this timeless story has a folktale feel, full of charm, heart and a bit of magic. One of the interesting things I found myself wondering is what made Dominic so determined to defeat the Doomsday gang. Was he getting revenge for the way they had tricked him, or was he trying to make his world a safer place for his friends? The length of this story makes is a good choice for a broad age range. While 3rd graders and older will get the most out of this rich story, young children enjoy it as well. William Steig wrote many of my favorite classic picture books: Sylvester and the Magic Pebble, Dr. DeSoto, and The Amazing Bone. His language is rich and imaginative, perfect for family listening. The review copy came from our public library. If you make a purchase using the Amazon links on this site, a small portion goes to Great Kid Books. Thank you for your support.